Singers and musicians from Fania Records including Celia Cruz (bottom, center), Ruben Blades (directly above Celia Cruz) and label co-originator, Johnny Pacheco (top row, fifth from left). The music produced on Fania albums can also be considered the soundtrack of the Afro-Caribbean political awakening in the U.S. northeast. Puerto Ricans and Cuban-Americans flexed their political and musical muscles at the same time, gaining influence in both arenas along the way. The storied legacy became a tangle of probate hearings and misplaced tape masters when co-founder Jerry Masucci died in 1997. In 2005, Miami-based Emusica Entertainment Group purchased the Fania catalog and publishing, assigning the label to its imprint, Código Records. Since then, the label has enjoyed a robust life in streaming with Spotify even developing special ways to feature the music. In 2014, Código invited a cadre of well known DJ's and producers to take digital copies of master tapes and produce remixes that exposed the original tracks to a whole new generation. Last Friday, the independent record company Concord Music announced they purchased Fania from Código for an undisclosed sum, giving music from Fania artists like Celia Cruz, Ray Barretto and Héctor Lavoe an even longer life of making people shake their hips on dance floors and in living rooms. Sig Sigworth is president of Concord Music's Craft Recordings, an imprint that also manages the classic R&B catalog of Stax, Fantasy Records jazz and rock classics and Rounder Records substantial American folk recordings. I spoke to him about what's in the future for Fania Records' musical and social legacy. Felix Contreras: Can you explain just what it is that you folks purchased? I understand it's both the actual music and the publishing. Sig Sigworth: Correct, yes. So it's masters and publishing of the Fania catalog and that's audio, visual masters and publishing. So for the layman, publishing includes basically the ownership of the compositions themselves, correct? Correct, yes — what the musicians wrote as opposed to the recorded music. Can you explain why publishing is important as part of this deal? Yes, we're kind of a unique company in the sense that we're a very integrated music company where our publishing group sits with us with the master's side and we work very closely together on catalog where we share masters in publishing. So when you're in a purchase like this when you acquire what you call both sides masters and publishing, it helps us a lot in, for example, synchronization. So, if we want to sync a song to a film or an advert or something we can clear both sides — both the publishing and the master side in-house. So it makes for a most expeditious clearance and also from a revenue perspective, you know, we can manage both those sides. Is this something that you guys had your eye on or is it something that people approached you [about]? What was the background of the purchase? We've been interested in Fania for a couple of different reasons. One is, apparently, many years ago Glen Barros, one of our executives, was interested in purchasing Fania probably a decade ago and that just didn't happen at the time. But we, a couple of years ago had acquired the Musart catalog, which is the largest independent Mexican label, and have seen great growth and success with that. 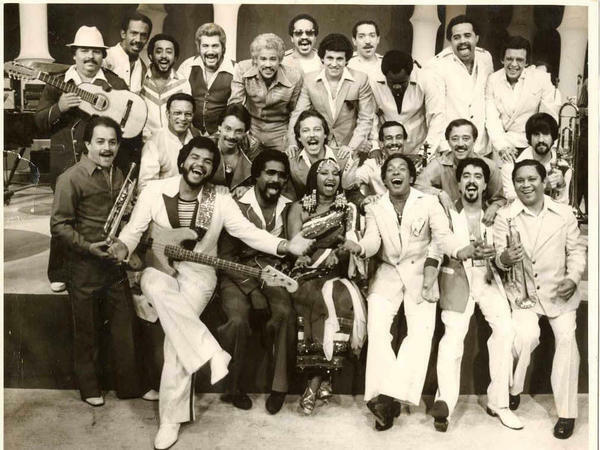 We felt that adding Fania into it would really boost our our space in the Latin music business. Now when you say great growth and success what exactly does that mean? We're seeing a lot of streaming growth in terms of the Musart catalog and Latin music in general and felt that from a global basis it was a good business to be in that so we can you, again, maximize the the growth of the streaming platforms across our masters and publishing. Can you preview any special reissue plans you guys have in mind? It's pretty early days for that, but I can tell you that the focus of Fania for the last several years has really been in that digital space and that streaming space. However, they've totally stepped away from the physical goods for the last couple of years so I think there are opportunities there in the physical space to do a variety of things that are well curated and well crafted. So it works not only as a physical good and revenue stream, it also works as a marketing driver for the streaming platforms. Amazing. Can we expect to see some some vinyl reissues? Yes, I would hope so! How much did [former owners] Código do in terms of reissues and remastering and how do you guys expect to add or improve on that? Again, it's a bit early, but Código did do a lot of research finding tapes, transferring them for digital exploitation. Some of the things that we need to get into is figuring out, "Did they do high resolution transfers?" If not, then we could look at doing those to take them to the high-res platforms like HD tracks and so forth. We were talking about vinyl. We like to whenever possible go back to the original analog sources and master and cut vinyl from that to really lend itself to the audio file and get that great warmth that you hear on vinyl. So those would be some examples of some things that we need to look into. One of the things that they did recently — probably within the last five, six years or so — was turning some of the masters over to DJ's and producers for some of these amazing remix albums. I'm of the opinion that stuff like that only enhances and adds to the already existing masterpieces that are there. Is that also something that you guys are considering? You know, I totally agree with you! And the interesting thing is since the announcement we've had quite a few inquiries from some DJ's and other artists who are interested to talk to us and see what we can do together with the catalog. And I think you're right in terms of working with the right people to create derivative works from the existing masters. It does two things: Not only does it freshen it up and give you a new work, but it also gives us a spotlight on the catalog and you can use that to look backwards. I just have one last question. As soon as the news about the purchase was announced there was quite a bit of chatter in social media that I'm involved with about what this means for those records. There's a very dedicated community of Fania fans who consider the music on an extremely personal level. It's part of their lives, part of their expression. What they wanted to know was, "What is this record company going to do to preserve not just a series of recordings but a cultural cultural and social history?" How do you answer that? So, a couple of things. One is, for me personally, I started my career as an independent label IRS Records back in the time and we were kind of Quixote- esque. We felt as we were jousting at windmills and trying to develop you know this mumbling band out of Athens, Ga. called R.E.M. So I understand it from a label perspective in wanting to have that and then spinning that a little bit into some of the other things that we have. We have the Stax repertoire, and again, that's very important not only musically but socially and culturally. To be an integrated record label in Memphis during the height of the civil unrest and race relations issues and, obviously, the killing of Martin Luther King Jr. And so we worked very closely with the Stax Museum in Memphis with the artists involved to not only propel that musical legacy but also that historic legacy. And, you know, I'm a real believer in the fact that it's not just about the music. It's the music, it's the artwork, it's the culture, it's where it came from. It's those artists, the politics that were involved at the time and people have real connections to that. And so you have to take that into account and you can't whitewash that. You have to dig deep into those things.